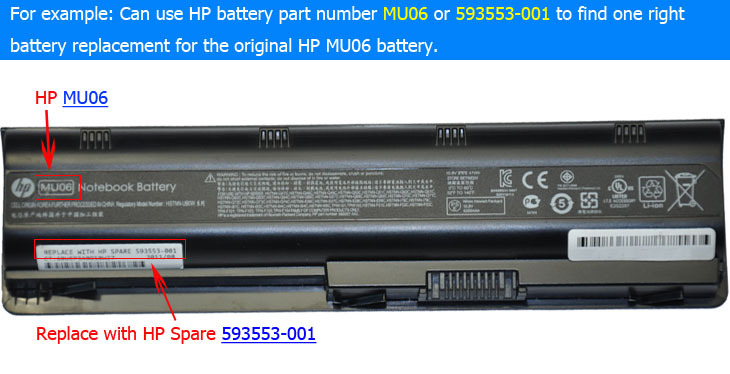 ﻿ FAQ - replacement HP laptop batteries | Compaq laptop batteries are Free Shipping from hplaptopbattery.co.uk! 1. How to find one correct battery for my HP laptop? 1. find out your old battery's part number, the part number on the battery like HP MU06,CC06,EV06,GB06,MO06,MU09,DD06,ZZ06,PH06,VK04,LA04,OA04,PI06,VI04,HSTNN-DB72,HSTNN-Q63C,593553-001,630193-001 etc, then you can search the battery part number at here HP Battery Part Number List to find one right battery for your HP laptop. 1. 7.2V and 7.4V are compatible, they are in common use. 2. 10.8V and 11.1V are compatible, they are in common use. 3. 14.8V and 14.4V are compatible, they are in common use. ( for example if your old battery's rating is 10.8V, but our is 11.1V, don't worry, our 11.1V battery is compatible with your laptop, it won't damage your laptop. 3. Don't worry about the difference capacity, high capacity just means the battery can last longer. But please note most high capacity batteries with a bigger size(shape), since them need extra spaces for the battery cells. 2. How Do Improve My Notebook Battery Performance? Notebook battery performance varies on several factors including: screen brightness, peripheral use, applications used, hard drive activity, CPU use and more. That being said, laptop battery performance can vary greatly depending on how the laptop is being used. Below are some general tips for improving notebook battery performance and run-time. 1.Through your operating system you can specify power management features and functions - optimize these features and areas to expand notebook battery run-time. 5.Properly store your notebook battery if you will not be using it for an extended period of time (one month or longer) in a cool, dry and clean place after fully charging the laptop battery. 3. Description looks very short, will this part or battery fit my computer? The part or battery is guaranteed to work with your laptop when you see your part's OEM part number (printed on battery label) or laptop model number on this page. The list might be incomplete because it is difficult to collect all information at one time. If you are not sure of your choice, please write details in comments box while ordering or email us(Contact Us). We will ship you the correct battery based on your order. Battery capacity can be different ie 4400mah, 4800mah, 5200mab, 6600mah or similar like this. It will still work in your computer without any problem. Higher capacity works for longer time(run time/discharge time) Only Some of the longer capacity batteries like 8800mah or 9600mah are bigger in size and sticks out of battery slot but they will still work in your computer. 5. Is this battery rechargeable? 6. How long does this laptop battery last? It depends on your laptop settings and workload, and it is hard to predict the exact time here. Most of our replacement batteries have higher capacity than the original ones, it means our batteries last longer between charge cycles. 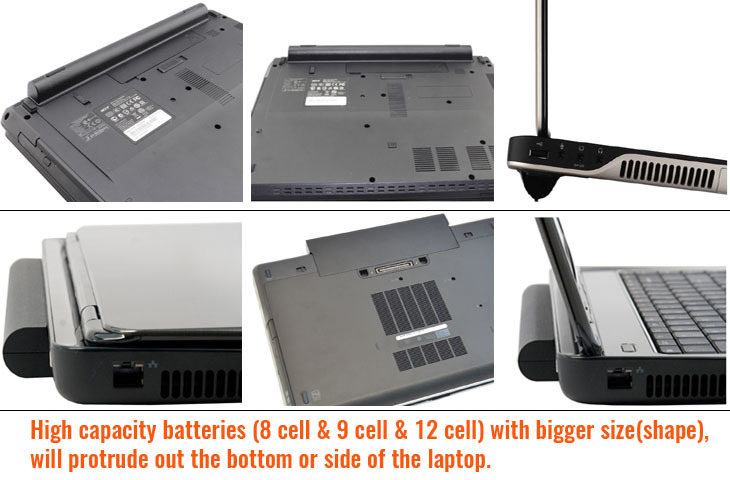 Higher capacity batteries have no impact on the performance of your laptop. 7. What is battery life? It is the number of battery cycles (i.e a full charge followed by a full discharge) a battery can offer before it needs to be replaced. Li-Ion batteries generally offer around 600-800 charge/discharge cycles. 8. Are 10.8V and 11.1V compatible? Are 14.8V and 14.4V compatible? 10.8V and 11.1V are compatible, they are in common use. 14.8V and 14.4V are compatible, they are in common use. 9. Why Buy From Us? We sell freshly produced and brand New batteries, Chargers & Merchandise. We don't keep it on shelf because of our high-volume sales. We are able to sell Good Quality products at low prices because we buy direct from Manufacturers & Distributors in bulk quantity. We never go after quick, one-time profit. Our motto is excellent products and customer service which is our permanent promise to you. We have 30 days replacement warranty. It is very easy for you to return or exchange the product. 10. How to Extend My Laptop's Battery Life?